I had never been to the Pullman area of Chicago until a few years ago when my editor at a regional newspaper sent me on an assignment to cover a press conference with several elected officials touting the Pullman area and urging the recognition of the historic area as a national park. I hung around in the area long after the press conference had ended. I stopped in a small info center and chatted and viewed an exhibit. I walked around the neighborhood photographing the rows of houses, the exterior of the Hotel Florence and the big old stone church. I was charmed by the neighborhood and envisioned in my head what the place must have been like a century ago. The notion of a new national park in Pullman - as dozens of other facilities in the national parks system had been shutting down - seemed very unlikely, preposterous even. But, it helps when the president hails from the area. Before we knew it, it was happening. Pullman had been designated a National Historic Monument. Things have been hopping in Pullman ever since. A cafe is welcoming visitors. A brewery in the area has been growing. And I was so happy to hear about this exciting facility that opened in Pullman last year, Gotham Greens. Gotham Greens originated in 2009 in New York and they have 3 urban rooftop gardens there. The facility in Chicago spans two-acres on top of the Method Products manufacturing plant. It's the world's largest and most-productive rooftop farm. I buy a lot of greens in plastic packages and most of the time, by the time it gets to the sell-by date they are already getting slimy and wilted. So, I consider it a big score when I buy a package and it stays fresh for a couple days. 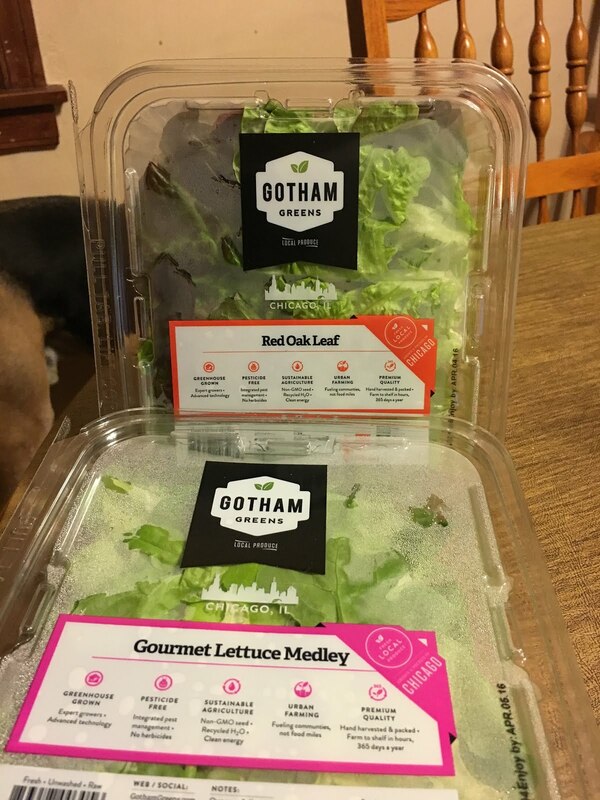 I don't know what Gotham Greens does differently to make their greens so crisp and fresh. They are holding up beautifully so far after two days. They also seem to not cram a big amount in there and I think that helps. The greens aren't crunched, but have room to breathe, I guess. :) They are also placed in the containers in nice large leafs, so they are great for lettuce wraps. I can't wait to get my hands on some more of this product. I will definitely seek it out as I shop - it can be found around Chicagoland at such places as Whole Foods, Treasure Island, Sunset Foods, Plum Market, Hyde Park Produce and through Peapod. Find out more about Gotham Greens at GothamGreens.com.